So here's a modern concept: I watch all my TV online. I have never been able to guarantee that I'm going to be home a certain time every week to catch whatever show I'm currently drooling over, so the fact that Hulu, Netflix and networks themselves put full episodes online fills my little heart with glee. Right now, among other great shows, my girlfriend and I are catching up on ABC's Once Upon a Time. During one of these cutesie date nights by laptop light, I realized the show has a neat allegoric to one of our most treasured principals- we lived before we came here. The show follows a bunch of fairy tale characters, namely Snow White and Prince Charming, who are placed under a powerful spell by the evil Queen to be teleported to a distant land where all their happily ever afters are taken away. This manifests in the form of a small town in Maine called Storybrook, where all the fairy tale characters live without memories of their prior selves. The only way to break the curse is if Snow White and Charming's daughter, a freaking awesome bounty hunter named Emma Swan, who was protected from the curse by an enchanted wardrobe forged by Gepphetto. I know, this sounds like if Buffy the Vampire Slayer slammed into Kingdom Hearts, but stick with me I'm getting somewhere. The only people who know the curse exists at all is the evil Queen, now manifested as the mayor of Storybrook, and her son Henry. An interesting twist is that Henry is actually Emma's son, that she put up for adoption and was snatched up by the Queen. Henry knows about the curse because of a storybook his teacher, the former Snow White gave him, that has the history of the land before they all showed up in Maine. 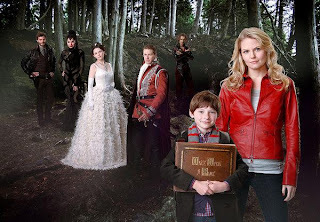 The show flashes between Storybrook and fairytale land to reveal plot points and show what the characters were like and what they did before the curse. The part I wanted to get to is the phrase that chokes me up every time I think of it, "All your happily ever afters will be taken away". Right before the curse hit, it seems like all the fairy tales had reached their conclusions, thus everyone was happy. Pinocchio was a real boy, Red Riding Hood had Granny, Snow White had her Prince Charming and even had a daughter. They lived in a beautiful kingdom in relative peace, which makes the Queen's curse that much more painful. As the series begins, Snow White is a lonely school teacher, Charming is in a coma, and even Jiminy Cricket, now the town's psychiatrist(which in my opinion was just writing genius) is forced to sell out his own consius to keep his job and home. All this so that the evil Queen can play with everyone's lives and make them just as miserable as she is. There is a ray of hope. As I mentioned before, Snow White's daughter was sent to our world before the curse could effect her. In the first episode there's a scene where Snow is crouched over her husband as he bleeds out from a wound, tears running down her cheeks in her daughter's nursery. The evil Queen walks in, flings open the magic wardrobe's doors to reveal the baby has disappeared. 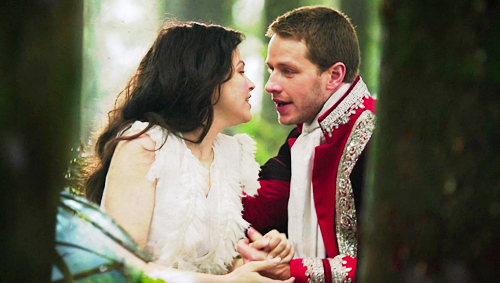 Snow looks up at her, smiles, and through tears says "It's too late. You've already lost." Emma shows up at the insistence of her son, and stays when she believes the Mayor is mistreating him. Her presence in the town causes unforeseen changes, including Charming to wake up and townsfolk finding the courage to stand up to their oppressive monarch. What does this have to do with pre-existence? To me everything. Like us, the characters come from a world where they were happy, but have now forgotten who they really are in exchange for the beliefs about themselves that evil has forced upon them. How many women struggle with self-worth when once they were princesses? How many men cower in the face of a challenge when once they charged into battle against the Adversary? Why are so many content to be peasants when called to be heroes? When we remember who we were, that we stood with our Savior and agreed to come down to what the wicked Queen called "Somewhere horrible", then we realize that "were" should be replaced with "are" and we live up to our true potential. We can become the righteous kings and queens our heritage provides us, by overcoming the world and standing up to what we know is right. I know why I get teary eyed at the idea that "everyone's happily ever after was taken away", it's because this really isn't the place where happily ever after is. That place is yet to come. Best review I think I've ever read Joe! Delightful and well written, love the blog. I love the post, Joe! 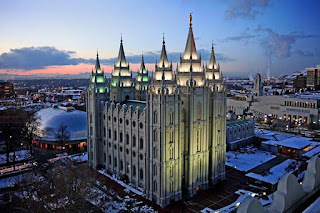 I love that show, and I love the connection you have seen to the gospel! !